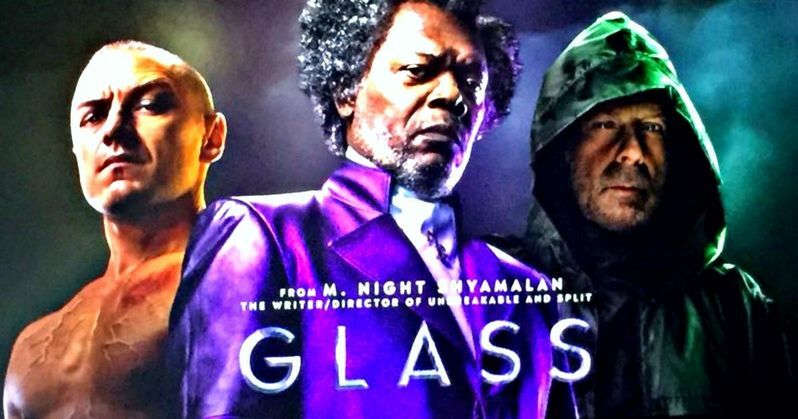 Universal has unveiled the first footage from director M. Night Shyamalan's Glass. The footage debuted at CinemaCon and, though it hasn't yet been released online, the reaction to the footage on social media has been extremely positive. The studio also revealed a banner for the upcoming sequel to Split and Unbreakable, which shows Bruce Willis, Samuel L. Jackson and James McAvoy gathered together as their respective characters. Warning: potential minor spoilers ahead for Glass if you'd rather go in not knowing anything or don't want to know what's going to be in the trailer. The footage shown reveals that American Horror Story star Sarah Paulson is playing a psychologist who is dealing with David Dunn (Bruce Willis), Kevin Wendell Crumb (James McAvoy) and Elijah Price, aka Mr. Glass (Samuel L. Jackson). The footage includes several scenes of the characters interacting with one another, with Dunn trying to stop an apocalyptic event. It was also revealed that all of the characters will be in jail, which is something that was previously not known. There's no word on when the studio plans on releasing the trailer for Glass, which serves as a follow up to 2017's Split. That movie, as revealed in the closing moments, was set up as a secret sequel to M. Night Shyamalan's Unbreakable. This movie will focus on Samuel L. Jackson's character Mr. Glass. Jackson, Bruce Willis, Sarah Paulson and James McAvoy, in addition to Shyamalan were in attendance at CinemaCon to show off the footage. The director called this the "first truly grounded comic book movie." Jackson had a bit of a different take, saying this on stage. "It's about time I got the title role in my own mother f*****g movie." Blumhouse Productions, who teamed with M. Night Shyamalan on Split and his previous movie The Visit, are once again producing Glass. Universal will be distributing the movie domestically, with Disney, somewhat surprisingly, handling distribution of the highly-anticipated sequel internationally. In addition to the aforementioned cast, Anya Taylor-Joy will also be reprising her role from Split in the sequel. Split was a massive hit for the studio, bringing in $278.3 million worldwide, working from a budget of just $9 million. That makes it one of the most financially successful movies of 2017 overall. With that in mind, it's no wonder that Blumhouse jumped on the sequel quickly and that Disney decided to partner up for distribution. There is money to be made. M. Night Shyamalan, prior to The Visit and Split, had been in director's jail for quite some time after a string of failures like The Happening, The Last Airbender and After Earth. If he can truly pull of Glass, it sounds like he's definitely made his way back to greatness. Universal Pictures is set to release Glass in theaters on January 18, 2019, which means we should be able to see a trailer sometime this summer. For now, you can check out the first banner for the movie for yourself below.